Since its first reported use by the ancient Babylonians the emerald has long been a popular choice of gemstone, with historical figures including Cleopatra holding them in high regard. Colombia and Zambia are the two main centres for modern emerald production, with Zambian emeralds being highly sought after for their strength and purer hues, making them the perfect gemstone for both emerald engagement rings and eternity rings. 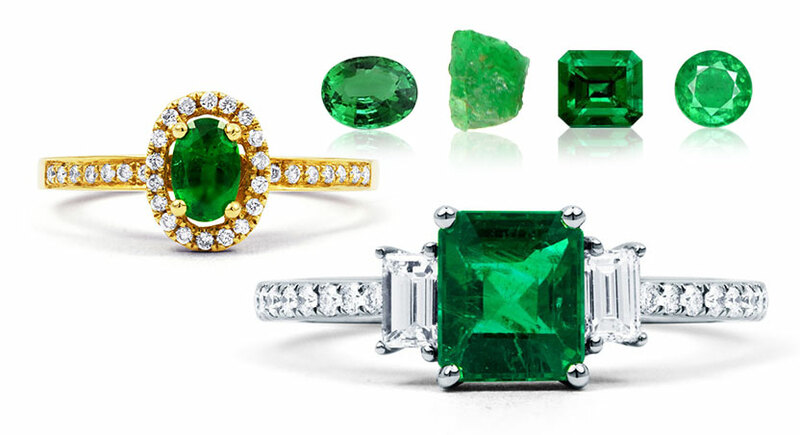 A popular stone for engagement rings and eternity rings the emerald has a long, rich history that dates as far back as the ancient Babylonians, who were selling the strikingly green gemstone at market stalls as early as 4000BC. The Egyptian Queen Cleopatra, who is perhaps the most famous historic wearer of emerald jewellery, was so enamoured by the stone that she even saw fit to oversee her own emerald mine. Whilst emeralds are mined throughout the globe, Colombia is currently the largest exporter of emeralds, producing up to 95% of the world’s production. The second larger producer of emerald is Zambia, which until 2004 accounted for up to 20% of all emeralds produced worldwide before being overshadowed by Colombia. Despite Colombia’s dominance in the emerald market, experts actually regard Zambian emerald as the best in terms of quality, producing stones that exhibit greater hue and less brittleness than their Colombian counterparts. Naturally flawless, high quality emeralds are uncommon, and as such it is common practice for the gemstone to be treated via a process of oiling in order to enhance its clarity. Cedar oil is the most common form of oil used for treatment, but more recently synthetic substitutes are being employed that offer a high refractive index. Emerald is never heat-treated. Emerald is a green variety of beryl. The mineral’s strikingly green hue is derived from trace amounts of chromium and occasionally vanadium. With a Mohs scale of 7.5 - 8, emerald is a relatively hardy mineral whose hardness is somewhere between that of Quartz and Topaz. Despite its hardness, emerald exhibits a relatively brittle surface that can easily become scratched if proper care is not taken. While most scratches can be wiped off, scratching can be avoided by not wearing the stone while engaging in physical activities. Emeralds are easy to clean, but care must be taken to avoid inadvertently causing damage to the stone. Use lukewarm, running water and a mild soap to clean your emerald, gently brushing the stone with a soft toothbrush. Avoid cleaning the stone with hot water as the high temperature can react with any fillers and oils that were used to treat the emerald which can lead to damage. Once all accumulated dirt has been removed, rinse the emerald with lukewarm water and gently pat it dry. Traditionally, emerald is the birthstone for the month of May, as well as the astrological gemstone of Cancer, Taurus and Gemini.